Call it FREXIT: The Forster Rothbarts are leaving. I'll be spending the rest of 2016 in eastern Ukraine, where I'll be documenting the Russian-Ukrainian conflict in Donetsk. My family will be living in Ivano Frankivsk, in western Ukraine. (Note my old email address is currently inactive). MY US cell phone 607-267-4893 is active but will go straight to voicemail. I'll check messages rarely. My office phone 917-387-4952 forwards to me in Ukraine. My Ukrainian cell number is +38 050 496 3811. 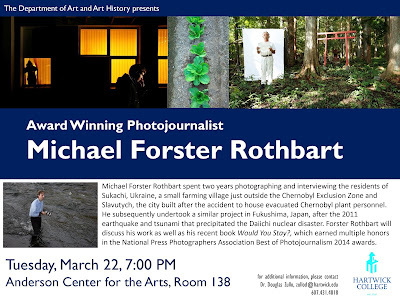 March 22, 7 pm. Hartwick College. Oneonta, NY. Anderson Center for the Arts, Room 138. The maps that most news organizations are using to tell the primary election story fail on several counts. (clockwise from top right), March 2016, don’t show enough information. These maps accompany articles about primary race results. The key question: who is winning? In other words, how many people are voting for a candidate, and how many delegates do they get? That, unfortunately, is not what these maps show. Candidates win delegates, not states. In Democratic primaries, candidates win delegates proportionally, based on vote tallies. In Republican primaries, this is true in some states. 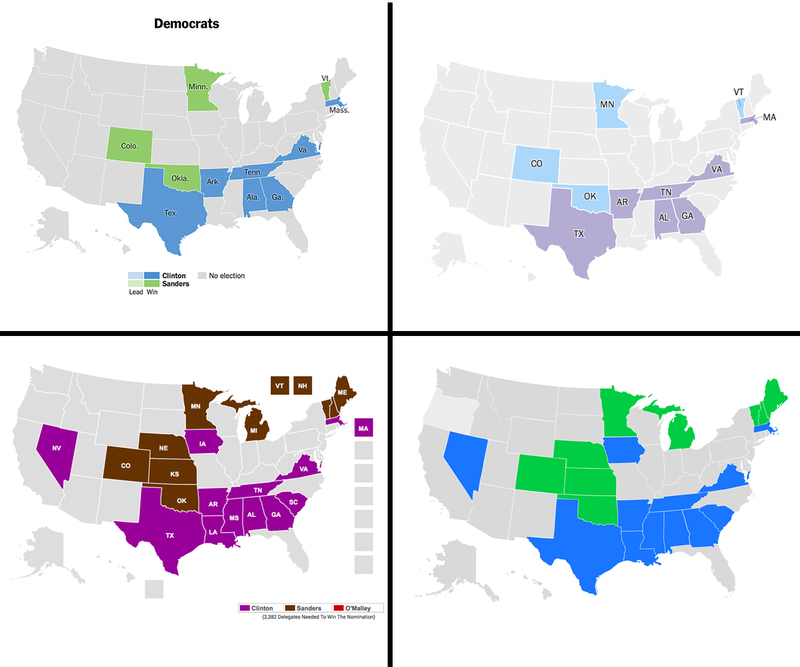 Painting all the states a candidate “wins” the same color is misleading. Population matters, not geography. The relevant information is the number of voters, not the size of a state. However, traditional maps emphasize a state’s area, not the number of people. 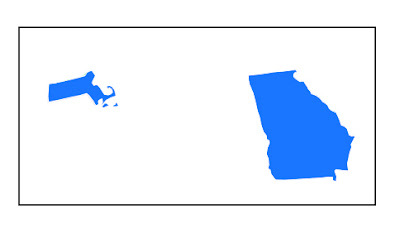 As an example, compare Massachusetts and Georgia. Both are painted the same “Hillary blue,” although Clinton did far worse in Massachusetts. Where did Clinton get more votes? This map doesn’t say. This map tells a reader none of this useful information. However, it does show that Georgia is 5.6 times the area of Massachusetts, an irrelevant fact. Kudos to the Times, which switched last week to using much more detailed maps. Perhaps too detailed. Viewing individual county results can be fascinating, but it’s easier to get lost in minutiae than to see the big picture. (Who knew Noxubee County, Mississippi, which is 72% black, had among the highest percent support for Clinton in the nation? Of course, only 1,531 people voted in the whole county.) Case in point. It’s amazing to have so much information available so soon, but this map doesn’t help tell the main story of the primary race. Look at the map above and tell me, who won what in Nebraska? Beats me. I’m a photojournalist. I think a lot about how to tell stories visually. A news article tells the facts of a story; a news photo ideally provides a more gestalt understanding. The same is true of maps. Like photojournalism, news maps should be tools for storytelling. Ideally, they show information relevant to a story and leave unrelated details out. 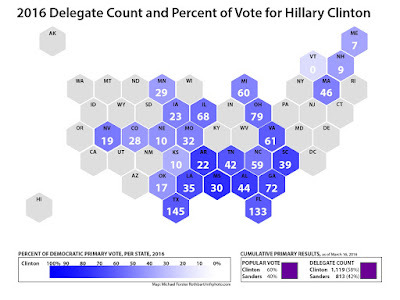 I set out to create new maps that clearly show the vote and delegate results. First I tackled the problem of illustrating proportional wins. Instead of using just one color per candidate, I used a spectrum. 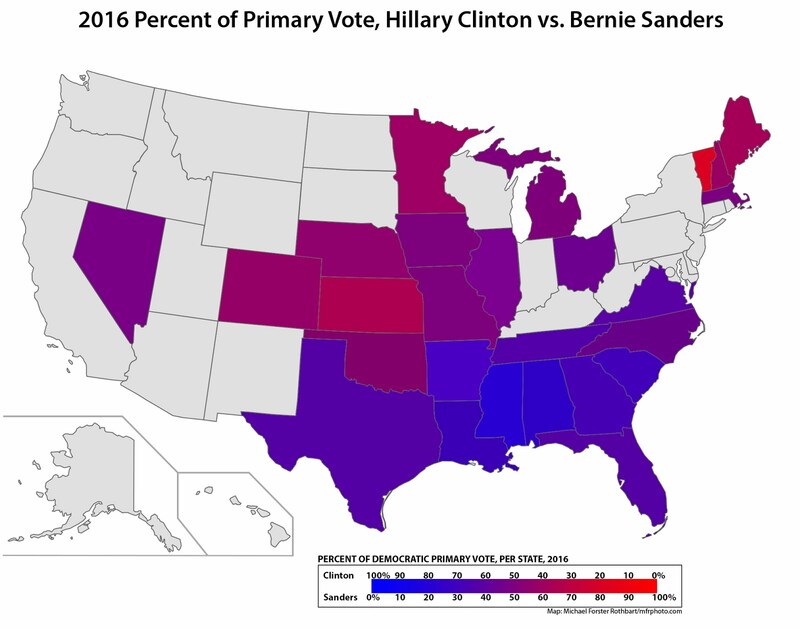 In my Democratic map, Hillary Clinton is marked blue, Bernie Sanders is red. The redder a state’s color, the higher the percentage of people who voted for Sanders. For example, Vermont is the reddest state on the map, 86% red, 14% blue. Clinton’s best showing was in Mississippi, 87% blue, 13% red. Hopefully, this map shows readers at a glance who is winning by how much and where. The next step is to eliminate geography from my map. I created a map based on one by Danny DeBelius and Alyson Hurt at NPR. Now it’s a “cartogram” — half cartography, half diagram. The colors are the same as before, but state shapes and areas are no longer shown. The last information to add is the delegate counts. There are several ways to do this; for now I settled on simply showing the numbers on separate maps. Not because this is best, but just because turning the map into a 3-D rendering will take me some time. 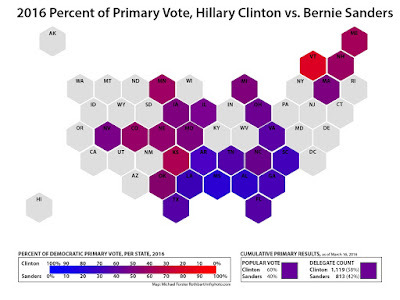 Do these maps help you understand the primary election? 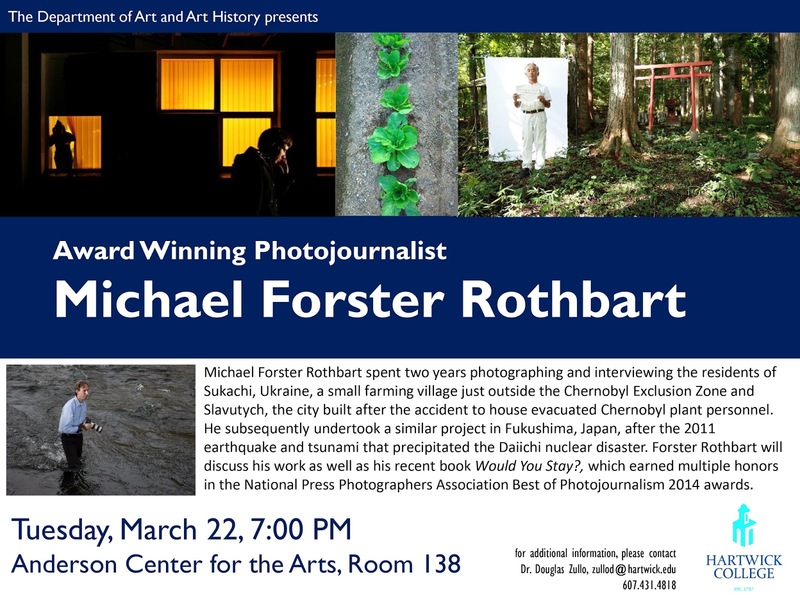 Let me know why or why not — on Twitter or Facebook @mfrphoto. Next up: four-color, four-candidate maps of the Republican primaries. Will it look interesting or just look like the shades of mud the candidates have been slinging? Check back next week to find out.